This morning I managed to forget my umbrella during a rain shower, trip up the stairs, and get an ink stain on my favourite shirt. All within the space of an hour. It wasn’t until I’d dried myself off, rubbed my bruised shin and dabbed the ink out my top before I realised the date. Friday 13th. Now I’m not superstitious I swear *cough* but given my morning of misfortune, I thought it couldn’t hurt to arm myself with a few lucky charms. Y’know, just in case. Whether you’re superstitious or not, maybe these will stop you from facing the same fate as me (and my favourite shirt). Extra lucky for you is that I’ve already tracked down the best charms around, so you’ll be sorted for Friday 13th May 2016. If a black cat crosses your path then you’re on your own. 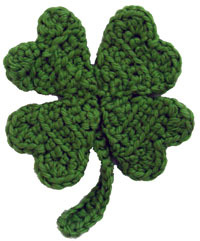 The four-leaf clover is probably the most universal sign of luck around thanks to its association with St Patrick’s Day. Druids traditionally carried a three-leaf clover, or shamrock, to help them see evil spirits. Four-leaf clovers were extra special as they offered magical protection. Don’t worry about them being tricky to find though – because I’ve tracked down this handy crochet pattern for you folks to knit your own. Phew! It’s super simple and easy to make, so whip one up and pop it in your bag, your pocket, or pin it to your coat and you’ll be lucky all day long. Horseshoes have long been considered a lucky charm and used to ward of evil spirits. There’s a legend which tells the tale of the Devil and St Dunstan, a blacksmith. The Devil asked for Dunstan to shoe his horse, but the crafty saint nailed the shoe to the Devil’s foot instead, which was understandably fairly painful. Dunstan only agreed to remove the shoe if the Devil agreed he would never enter a house with one nailed outside. 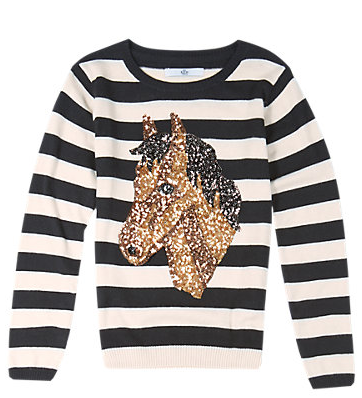 If you don’t fancy sourcing an actual horseshoe and nailing it to your front door, then this horse jumper is a good alternative. It’ll also ward off those evil spirits when you leave your house, a handy bonus. This one may be lesser known than some of its mainstream cousins, but mint is no less of a lucky charm. Traditionally used to attract good spirits and bring good fortune to the person carrying it, folks of yesteryear would attach a sprig to their coat for luck. 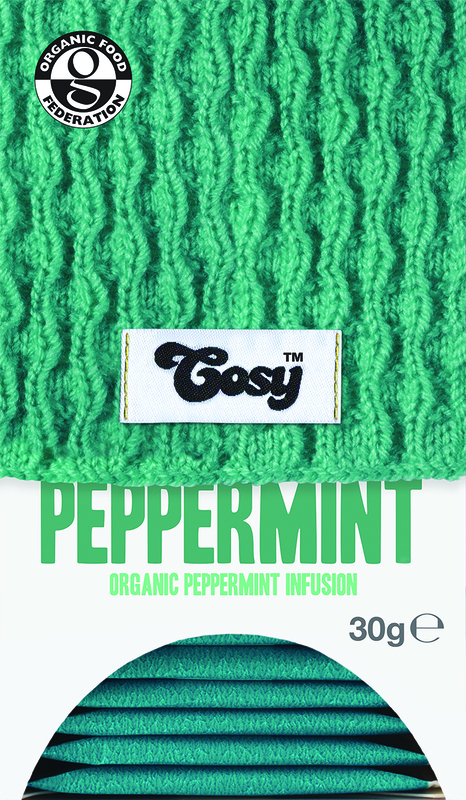 For a less pungent (and more refreshing) alternative, why not relax with a nice cup of Cosy Peppermint instead? Let’s face it, you’ll need it after the day you’ve had. Happy Friday, lovely people! I hope you’ve had a wonderful week, and managed to stay warm in this chilly February weather. Speaking of February, guess what day tomorrow is? That’s right, it’s Valentine’s Day! Whether you are a fan of this celebration or not, you can’t seem to get away from the pink and red lovehearts at the moment. 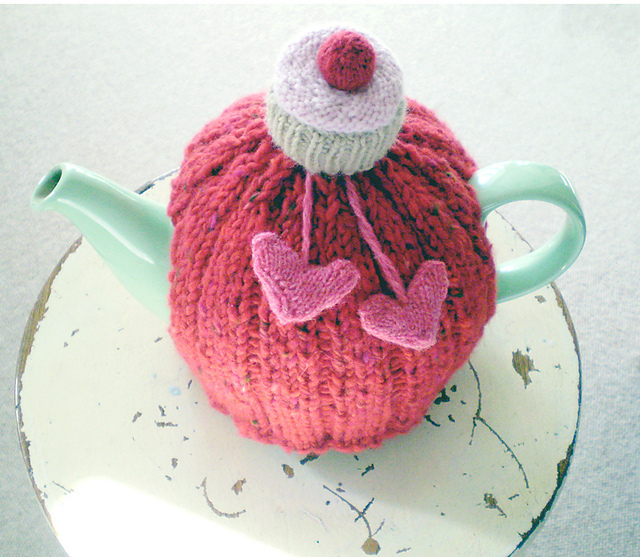 But it’s always good to tell our loved ones how much they mean to us and in honour of that sentiment, we’ve found you a romantic rose-bedecked tea cosy, because after all, sharing a pot of tea is a such a sweet way to say ‘I love you’. This beautiful design by Louise Fitzpatrick incorporates a simple knitted body with a bevy of gorgeous crocheted flowers sewn to the top. Knitted in classic stocking stitch, the main part of the cosy is very simple, with the first sections worked flat and then joined into the round for the top shaping, leaving gaps for the handle and spout. The really fun part is making the flowers for the top. Based on a pattern from www.funfreecraftlimited.com, this is great for newbie crocheters. As long as you can chain, slip stitch and double crochet, you can make these roses. And if you use a fun colourful yarn, like Louise did, they come out with the subtle variegations that real flowers have. Genius! There’s a fair amount of sewing involved with this design, but it’s so worth it – aren’t those buttons delightful? Make sure to give yourself a full afternoon to dedicate to the construction and take your time when you position the flowers. A little bit of effort goes a long way and after all, you want this cosy to show just how much you care about your people. Happy Valentine’s Day tea fans, we love you all! 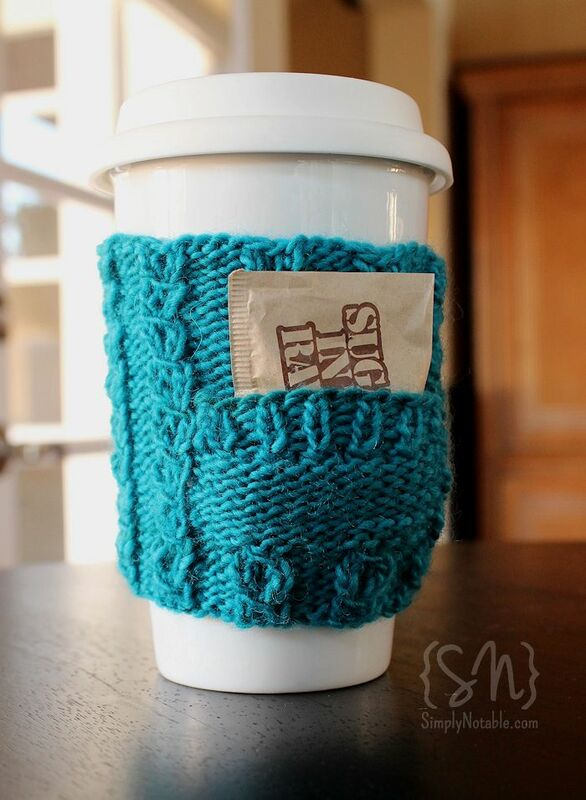 Our friend Julie over in Athens has come up with this fab little cup cosy with a pocket! Perfect for a sugar sachet or a spare tea bag, we love this design and wanted to share the knitting pattern with everyone. The pattern is available for free on Simply Notable – the blog that Julie shares with her daughter. 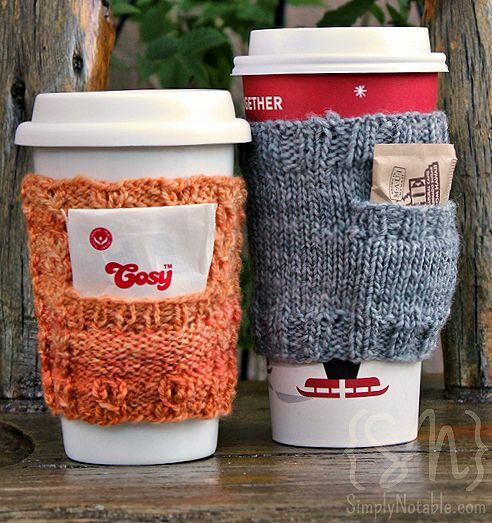 These mug cosies are a great project to knit up in a free afternoon, or even a couple of hours. Using just knit and purl stitches to make up the grey one, and a small cable stitch on the other, both patterns would be a good introduction for beginners that want to learn a few new knitting tricks. The pockets are created by picking up stitches from the cosy – so if you are new to this it will be good practice if for those planning to knit larger things like jumpers or cardigans. Julie also has an Etsy site on which she is selling pick a pocket cosies, for anyone wishing to buy one ready made! 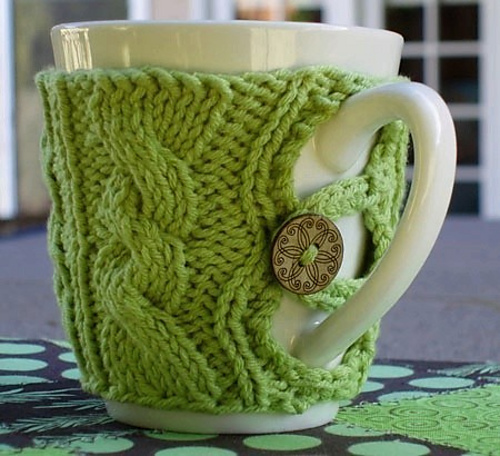 For this week’s free pattern we have a little variation on the Tea Cosy, a nice toasty woolly mug warmer! This mug cosy comes from Julie in Athens, who blogs collaboratively with her daughter at Simply Notable, where you can find the free pattern for this lovely cosy! The pattern is a really simple cable pattern that secures with a cute little button and crochet hoop that would be a great one for beginners to get started on. For non-crochers, Julie has provided a really useful photo-loaded how-to guide for the hoop. Now I’m not sure about you, but my current favourite tea is a lovely cup of peppermint, and I’m looking forward to making myself one of these to keep on my desk. 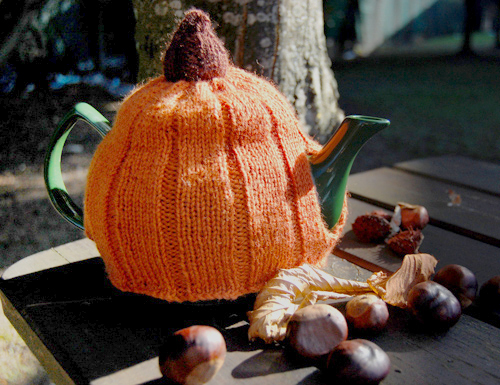 Here at Cosy HQ we are so busy thinking of new flavours and knitting cosies, that our tea needs to keep warm!